Getting your company’s data appearing on Google Maps, Bing Maps, Transit Apps and other transport software is mandatory these days. Your passengers and customers expect to be informed all the time and when you don’t meet their expectations they become disgruntled, interact negatively with your front-line staff and drag down the reputation of your company. But for many companies getting onto such sites is a technological challenge that is beyond them or a cost that is not factored into the budgets. AddTransit aims to make it easy and affordable to get your transport business appearing online. You need to create a GTFS Data Feed and the easiest way to create a GTFS data feed is with a GTFS Tool. A GTFS Data Feed is a special computer file that contains data about your route, schedule and stops/stations. GTFS is an acronym for General Transit Feed Specification. This specification was originally developed in partnership between a public transport operator and Google. Since then the specification has become the defacto standard for all the major internet companies (e.g. Bing, Yahoo, etc.) and also for all the smartphone, mobile and cell phone public transport and transit Apps. The GTFS Data Feed allows you provide your transit data in single feed to all these companies; a single update that becomes accessible to all your passengers, everywhere, all the time. 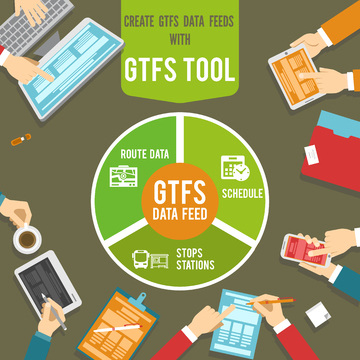 When you want to create GTFS data feeds, the easiest way is using a GTFS Tool. The GTFS tool ensures that the data is in the correct format and enforces consistencies and GTFS validations. The tool should provide an intuitive user interface, the ability to verify geographic data on maps and where possible, prevent user errors. The GTFS tool should allow you to easily export your first schedule and make changes to your schedule, route or stops a simple maintenance function. We also recommend an online tool, so that if the standard changes, you will automatically get the updated software. Well, if you’d like to get your schedule, routes, stops onto Maps. If you’d like to make it easier for your passengers and customers to access your timetables and plan their journeys. Or if you’d like passengers to self serve and reduce questions and queries to front line staff, then we recommend you Join AddTransit and get started. Christmas and the New Year are only a few weeks away! Do you have your holiday schedules out yet? Are your schedules online? And we don’t mean in a PDF file that your customers have to go digging through your website to find. You want your customers to be able to easily find your schedule on Google Maps or on their travel planning app from their phone, and you need to be able to quickly update them if bad weather causes changes. Transit riders expect you to be on time, every time, and they expect your route to be consistent. But you know that sometimes changes must be made. Your holiday schedule may have planned changes like coordinating around the Christmas parade, or sudden changes because of bad weather or a car accident blocking the road. Your customers will understand these hiccups if they know in advance, but not if you leave them stranded in the snow. Getting your schedules to your customers with a simple tap on an app, will allow them to plan ahead for changes. Also, if you customers can find your schedule on Google, they won’t need to call your office to ask about the schedule or to complain that they can’t find it on your website. This means less money spent on employees to answer customer calls, and most importantly, you’ll have happier customers who will want to use your service over and over. You CAN afford to make it happen, and you don’t need to hire an IT team. 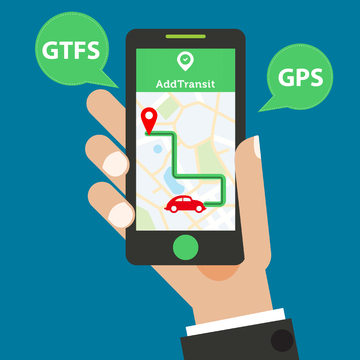 AddTransit can put your schedules and routes in GTFS (General Transit Feed Specification) which enables Google, Yahoo, and App Providers to easily include your data in their maps and travel planning programs. You can be competitive with the major transit companies for a fraction of the cost. 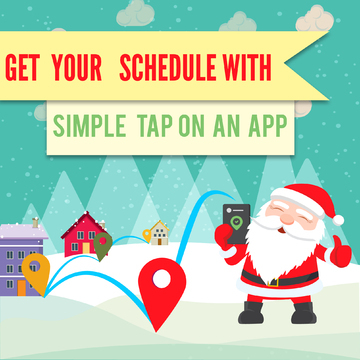 Contact us now to get your schedule on travel planning apps before Christmas! AddTransit’s online vehicle tracking software gives you cheap vehicle tracking in real time. Combining the power of GPS equipped smartphones, the Internet and custom built cloud based software results in cheap vehicle tracking for your bus, transit or transport tourism business. Using our apps or mobile Internet pages your drivers can login and choose their route and vehicle. The GPS enabled smartphones then provide the position of the vehicle as they travel along the route. The vehicles location can be viewed on AddTransit’s online vehicle tracking web pages in real time. 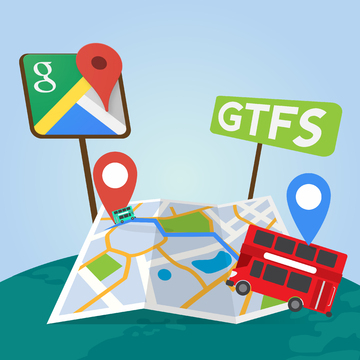 We can also use the GTFS (General Transit File Specification) real time format to provide the vehicle positions to App providers and Google Maps. It’s quick to set-up, easy to use and good value. There’s a number of challenges with the GTFS format. One is the complexity in it’s simplicity. A comma-separated values (CSV) file stores tabular data (numbers and text) in plain text. Each line of the file is a data record. Each record consists of one or more fields, separated by commas. The use of the comma as a field separator is the source of the name for this file format. Comma-separated values is a data format that pre-dates personal computers by more than a decade: the IBM Fortran (level G) compiler under OS/360 supported them in 1967. There’s a CSV file for each type of data (e.g. trips, routes, schedules, etc.) and these files are all zipped (a type of compression) to create a GTFS file. The simplicity means that a GTFS file could be created with the use of the most basic editor and a program such as Winzip. However the complexity comes, when you realise that each of the files have to reference each other. MS Excel tools (GTFS xls tool) have been coded but they are limited in their functionality and lack in inherent strength that GTFS brings with online maps. That’s why we created AddTransit. 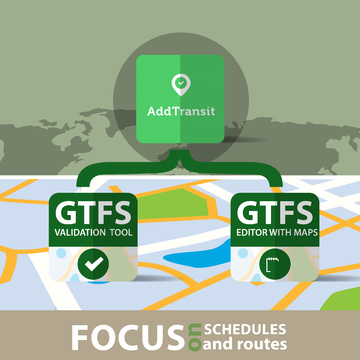 Our software includes a GTFS builder, GTFS validation tool and a GTFS editor with maps to view the locations and routes. Our software removes the need for you to worry about files, zipping and cross referencing between files. We provide warnings if there is gaps with the aim of making your job easier. This allows you to focus on your schedules and routes, and let’s you leave the intricacies of GTFS to us. Here’s the AddTransit GTFS Tools signup link if you want to Get Started. For many companies creating and maintaining a GTFS (General Transit Feed Specification) feed can be seen as a costly exercise. Existing processes are focussed on paper based schedules, booklets and posters and more recently on bespoke solutions for the companies website in text, PDF, graphical or even interactive formats. The provision of a GTFS feed is seen as a new expense and it could be associated with expensive software solutions and consultants. But, that doesn’t need to be the case. A GTFS solution actually allows you to reduce effort and whilst getting greater coverage of potential customers. Google’s, Apple’s and Yahoo’s maps software is now in daily use and most passengers are moving to smartphones which have a growing number of transit apps. All these services can provide your schedules from your GTFS file. Additionally you can include standard code on your websites that will provide interactive schedules and maps, that also use your GTFS file. As your schedule becomes available in many more ways using the same GTFS file and common software, your paper based schedules can be reduced and your schedule software development costs reduced. At AddTransit, we recognised the need for cheap GTFS so we make it easy to create, distribute and maintain the file. Our focus is on providing value for money regardless of whether you are a single shuttle bus, a fleet of ferries or a large public transport system. We want to make your GTFS experience great (and cheap), so contact us today to find out more. Getting your bus route to appear on Google Maps is easy with AddTransit. Our easy to use GTFS builder allows you to create and edit a GTFS (General Transit Feed Specification) file. 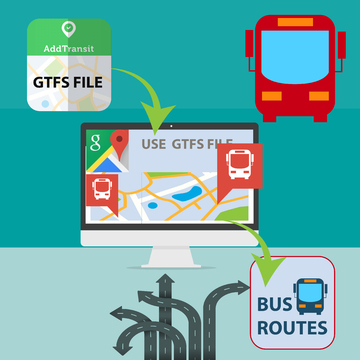 A GTFS file contains the necessary information to inform Google of your stops, schedule, routes and fares. You then notify Google that you now have a GTFS file for them to use, and subject to you meeting Google’s criteria, the file successfully passing Google’s validation and verifying that you will maintain the file going forward, Google will give you access to their Transit Dashboard. Google also automatically uploads changes on a regular basis to ensure that their online schedules stay up to date. Once the Google has processed your file, your customers/passengers will be able to view your bus schedules on the web in Google maps. And the best thing is, is that the GTFS file is used not only by Google but also by lots of other companies. This means that by creating one file you suddenly are able to make your schedule available in many different ways to your customers. When we designed AddTransit, we wanted the easiest possible tool to create GTFS feeds. After our initial reading of the General Transit Feed Specification, it became obvious that the GTFS standard was a simple solution that got complex very quickly. Additionally, for big transport companies with their large IT departments, the standard seemed cumbersome as it used zipped comma delimited text files for documenting the schedule and route information, whereas for small companies even these simple technicalities were often too large a learning curve for them to climb. Our vision, at AddTransit, was to build a simple GTFS tool that could make the GTFS format and it’s promise of easily communicating timetables and offering journey planning in multiple ways both affordable and simple. We took the specification and broke it down into it’s key components, designed screens that we believe are inherently intuitive and looked for opportunities for improvement in terminology and data entry. We realise that creating and maintaining schedules is a challenging task by itself, even before you get around producing and updating GTFS files. That’s why we try to give you simple and straightforward solution to the complexities of GTFS. Of course, the technical nature of the GTFS spec is still behind it all, but we hope that our great user interface, responsive customer service and affordable product will make your job of communicating and marketing a bus, train, ferry or shuttle schedules, so much easier. GTFS Benefits – Easy for Tourists! One of the reasons that GTFS is great is that it makes it easier for tourists. This is one of the “soft” passenger GTFS benefits. 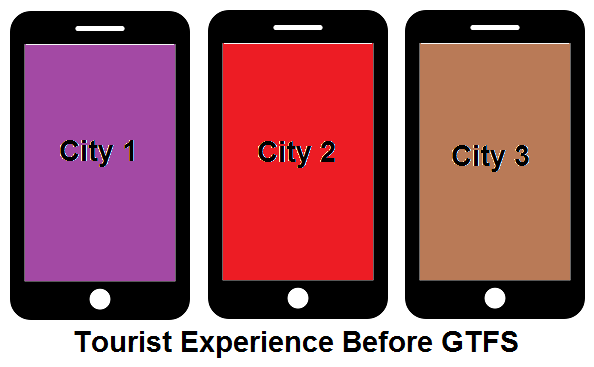 Before GTFS, when tourists visited a new city, if they wanted to use public transport they would need to learn how to use the cities public transport website, app or paper based schedules. Each cities information was displayed differently, so even if they were regular public transport users at home, they still had a learning challenge when they went somewhere new. After GTFS is made available for a city, it means that tourists can use their preferred journey planner (e.g. Google Maps, Rome2Rio, etc.) to see the cities local information. Now the tourists can focus on navigating their way around the city instead of learning how to navigate their way around the website, app or paper schedules. An additional benefit, is that a number of these GTFS journey planners are multi-lingual, meaning that now the city is far more friendly to tourists whose primary language is different to the primary language of the city. Of course, some may say that it makes cities less unique, however GTFS gives smaller cities the ability to present themselves in a way that their budget would never normally stretch to, and less face it.. not many people travel with the aim of experiencing/coming to grips with a cities public transport website/app. 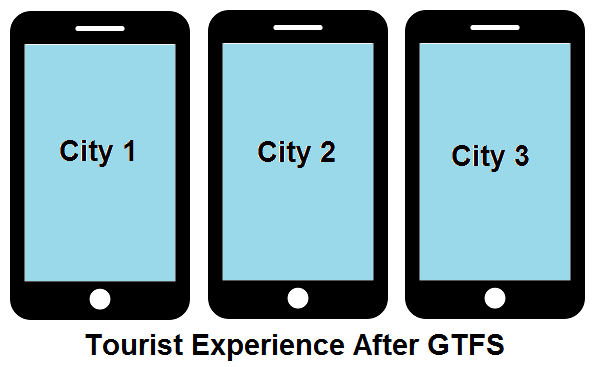 So in summary, one of the GTFS benefits is that it’s a great way for making your city friendlier for tourists. And for tourists, the benefit is they now can explore so many more places with a sense of confidence that they will get where they want to go, knowing when they have to leave and when they will arrive.